Bond Economics: When Should The Budget Be Balanced? When Should The Budget Be Balanced? Fall is in the air in the Northern hemisphere: the kids are back at school, the leaves are starting to change colour, and we have yet another pointless debt ceiling crisis in the United States. As far as I can tell, one of the root causes of debt worries is the assumption that a government budget should be run like a household budget: it should be balanced across the cycle. 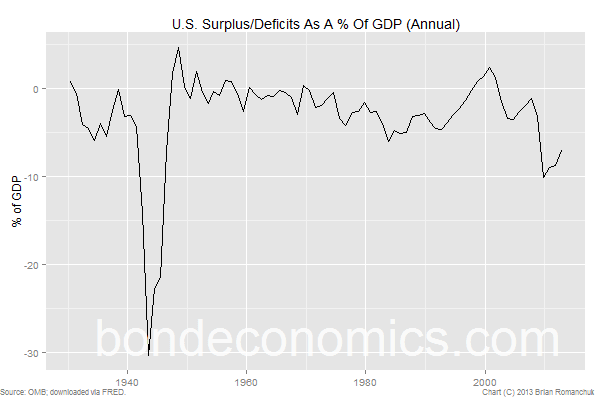 But as the chart above shows, the U.S. Federal government also never runs a surplus; it runs a deficit across the cycle. This is a relatively common occurrence for the general government sector across the developed nations; only Australia managed to run a sequence of surpluses. The fact that deficits are normal is actually a straightforward application of Stock-Flow Consistent (SFC) modelling (or practically any other serious simulation of fiscal policy). This is a theme often discussed by Modern Monetary Theory (an offshoot of SFC modelling) writers; for example see today’s article by Bill Mitchell which explains what happened in Australia. This article is less academically restrained restatement of the ideas seen in Appendix 3.4 of this text (non-affiliate link) by Wynne Godley and Marc Lavoie. I state below some conditions that I assert will hold for a large variety of reasonable models, and not just a particular model. In other words, you could create a model that violates the asserted conditions, but the model would otherwise imply “unrealistic” behaviour. I first assume that the model economy will reach a “steady state” condition: model stock or flow variables, when scaled by model GDP, will tend towards average values across the economic cycle. For example, household income as a percentage of GDP will oscillate around some fixed value over time. This precludes complex models with wildly varying growth rates and "endogenous structural changes". I also assume this is a closed economy (or at least the trade accounts are in balance). If the steady-state growth rate is zero (nominal incomes do not grow over time), the general government “fiscal balance” averages out to zero over time. If the steady-state growth rate is positive (nominal incomes tend to grow), the general government “fiscal balance” averages out to a deficit over the cycle. What is interesting about the SFC model analysis is that the fiscal stance of the government does not affect the statement that a growing economy will tend to have a fiscal deficit on average. The conclusion does not follow from looking at what the government sector is doing: it looks at the balance sheet behaviour of the non-government sector. (General Government Cash Deficit) + (Net Government Investment) = (Increase in the monetary base) + (Increase in the government debt). Using this relationship, we see how we can draw the conclusions above. If the government runs a balanced budget, the total stock of government debt and money holdings in the non-government sector must be unchanging. This implies that these stocks are falling relative to nominal incomes, which grow on average with the overall economy (the steady-state assumption). This violates the “stock-flow” norm behaviour followed by model entities in SFC models: they keep their financial asset holdings in line with their nominal income in the steady state. Additionally, we that any “demand leakages” which result in higher financial asset holdings in the non-government sector (for example, bond accumulation by foreigners), necessarily force higher government debt levels in a steady-state condition. And even if one is skeptical about the model assumption of stock-flow norms, it is clear that the monetary base cannot become arbitrarily small versus nominal GDP in a monetary economy. So this result will hold even if you want to use more standard mainstream economic models. I will end with one technical point: examination of my budget equation indicates “an escape hatch” that allows surpluses across the cycle: government investment. If we reclassify government outlays as investment, then it will be possible for the government to supply the needed financial assets without running a deficit. One example would be the monetisation of Gold in a Gold Standard regime. I view this escape hatch as being politically convenient relabeling, and is not too significant in practice. But yes, my statements above should be qualified to take this into account.